1. Insert a joint into the editor. 2. Click Edit Joint to open the Joint Properties. 3. Click on the More button to show the advanced properties. 4. 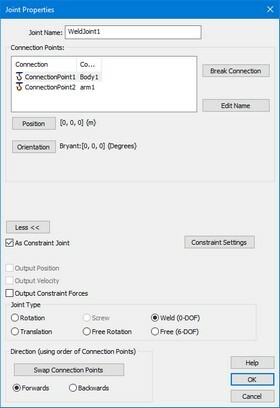 Select the As Constraint Joint option. 5. Now you will see the Constraint Settings button. Click this button. The Joint Constraint Settings dialog will open. 5. and select the desired stiffness and damping for the joint. • If you do not choose Override the General Spring Damper Values, the global settings for constraint joints are used which can be specified in the Model Settings dialog. • Only the degrees of freedom which are fixed by the joint, can be set by spring damper values. In the dialog above the spring damper values of an X-rotation joint are shown. The rotation around the x-axis can not be restricted by a spring damper. If you want to insert flexibility in all directions and rotations, use a weld joint to override the general spring damper values. 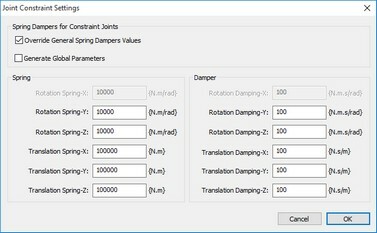 • You can choose the option Generate Global Parameters to make the spring damper values available as global parameters.